From mother and baby bears to an orphaned bear. Lindsay Mattick’s – I believe entirely true – story about the young Canadian vet who went to war in Europe in 1914. Vet Harry lived in Winnipeg, so had a long way to go before he got to the war, where his job was to look after the horses. When his train stopped in White River he saw a bear cub on the platform. A very special bear cub, or so he felt. He bought it for $20 from the trapper who had most probably killed the cub’s mother. The bear came with Harry on the train, and all the soldiers helped look after the cub and find food for him. He was a very hungry bear cub. Winnie travelled with Harry and the others all the way to England. But before they went to the war in Europe, Harry brought his dearest friend to London Zoo, where he left him to be looked after. A young boy called Christopher Robin used to come to the zoo with his father, and he loved playing with Winnie. I think we have to assume Lindsay knows all about this, since it was her great grandfather who liberated our dear bear. 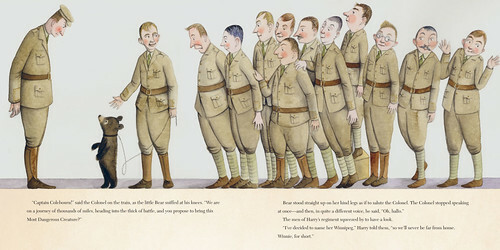 The fantastic illustrations are by the very reliable Sophie Blackall. There is only one thing nicer than a beautifully good read, and that’s when it’s unexpected. 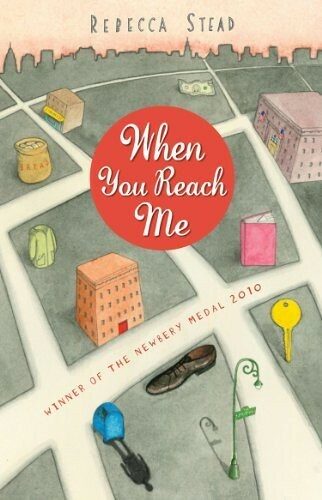 I’m not saying I thought Rebecca Stead’s When You Reach Me wasn’t going to be good; I’m saying I hadn’t heard of it or of her until I was offered this Newbery medal winning novel to read. And cynic that I am I thought it’d be good, but, you know, ‘just’ good. But it’s absolutely amazing, and I really loved it. I haven’t – yet – read A Wrinkle in Time by Madeleine L’Engle, but I must. Soon. Adults who have, will realise it has a bearing on Rebecca’s book, but I don’t think it’s a spoiler to mention it here seeing as it gets mentioned early on in the story. And for the child who knows the book, it will probably be doubly welcome to read another on a similar topic. Setting any such parallels aside, it’s all about friendship and the many ways in which you can be a friend. It is so very American and that is attractive, especially as it’s set in the late 1970s, with the freedom to roam children no longer have. I’m guessing it also means there is more of a mix of rich and poor, and it’s fascinating to see how close they live, and that the children go to the same school. Miranda lives with her single mother, who wanted to be a lawyer but had to give all that up when she had Miranda. Now her ambition is to go on television and win money. This sounds pretty shallow, but it isn’t, which is just one more piece of proof of the quality of Rebecca’s writing. The boy who Miranda has always been best friends with starts to shun her company, and she has to learn to talk to other children. And that’s what this is all about. The social mix makes it more important still. And then there is the ‘Wrinkle’ mystery, which Miranda needs to solve. Another positive aspect for me is the aspie-ness of one of the characters, which is done in an unusually nice way and not at all OTT. Something that would have made my reading experience much better however, would have been to avoid the reviews the publishers sent me. Most were of the normal type and I sort of glanced at them with some care, in case someone had been idiotic enough to give too much away. (I know, I know, I shouldn’t have been idiotic enough to read them in the first place.) Susan Elkin in the Independent on Sunday spent all of nine lines on her review, two of which went on the title, author’s name and publisher and price. So in the seven lines left to her she mentioned nothing but the whole ‘the butler did it’ thing. So I read the story knowing full well that the butler was the one. And it would have been nice to work that out slowly on my own. That’s the Wild Boars Cook for you. 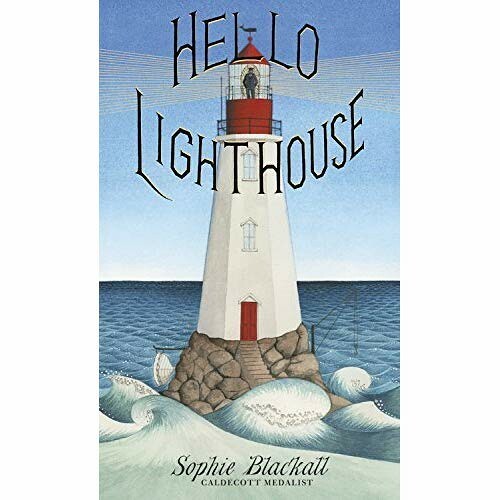 Meg Rosoff who claims to have written it, with Sophie Blackall on picture duty again, thinks so highly of this picture book that she forgot it was coming out in paperback this week. Or was that just pretending to be cool about it? It’s also won an award, the Westchester Children’s Fiction prize, which is American and that in turn explains why some of us, including Meg hadn’t heard of it. Well, now you have and so have I.
What’s more (=worse), I’ve read the boars’ cook book and it’s revolting. Should appeal to little ones, but do keep them out of the kitchen. The pudding with a squid on top is not to be recommended, but there is a recipe towards the end that you may find young cooks want to cook, or at least eat. Let’s hear it for Horace, Morris, Boris and Doris! Another piece of good news is that Meg’s revamped website is up and running. Where to I’ve no idea. It’s slightly improved in various aspects, and the big bonus is that Meg’s newsletters have become a blog. She has promised not to blog too often, which is such a relief, but the blog format is much much better. And you can leave sarky comments. I have. Fun. Jumpy Jack & Googily, the picture book by Meg Rosoff and Sophie Blackall, is finally out in Britain this week. Rush to your bookshop if you can. It’s the loveliest book about friendship. You’ll never be scared of monsters again. Socks, however, is another kettle of fish. Not me, but that’s not to say socks aren’t dangerous. 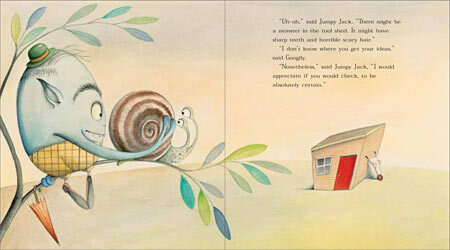 Jumpy Jack & Googily by Meg Rosoff, with illustrations by Sophie Blackall, is a new picture book. It’s so new it’s not out yet in Britain, but there’s always the internet. 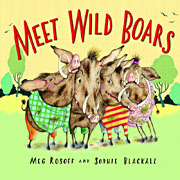 J J & G is better even than Meet Wild Boars, and as another blogger pointed out, the author information on the dustcover is almost funnier than the book itself. Jumpy Jack is very jumpy indeed, and scared of monsters. So it’s interesting that for a best friend he has chosen a, umm, a, well, someone blue with pointy teeth. This someone is really quite kind and caring, so he couldn’t have a better friend. J J is pretty good at being a good friend himself, too. This book gives a new meaning to monsters under the bed.